Introduction/ Background: All work in Antarctica relies on a consistent geographic framework, and the main function of the Standing Committee on Antarctic Geographic Information (SCAGI) is to manage and improve the geographic framework not only for Antarctic scientific research but also for other activities including operations, environmental management and tourism. SCAGI continues to deliver a range of Geographic Information products through its various projects. These products include the SCAR Composite Gazetteer of Antarctica; Antarctic Digital Database, Map Catalogue and Feature Catalogue. SCAGI integrates topographic and names information received from national Antarctic programs into the ADD and Composite Gazetteer of Antarctica. 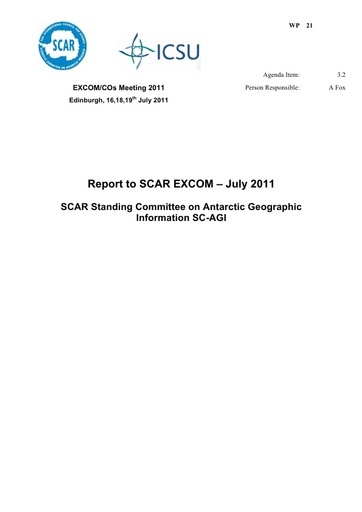 In keeping with Article III.1.c of the Treaty that Scientific observations and results from Antarctica shall be exchanged and be freely available, SCAGI promotes an open standards approach to support free and unrestricted data access and contributes to developing the specifications for this. Most of the effort in SCAGI comes from a few committed members, this is not sustainable in the long term. It is highlighted by the difficulty in recruiting a new Chief Officer and the lack of engagement by South American countries, despite the 2010 SCAGI meeting being in Buenos Aires. Delegates should ensure that they are familiar with the work that SCAGI does and encourage their national representatives to become involved with and contribute data to SCAGI products. Delegates should ensure that retiring national representatives are replaced with a successor national representative. Partners: SCADM, SCAR member countries, other organizations with an interest in Antarctic geographic Information such as COMNAP, Antarctic Treaty System, IHO, NASA, Google. For the SCAR CGA and SCAR ADD to be improved, either SCAGI members must take on the necessary work or the work is outsourced. Continuation of $4k a year allocation is requested.